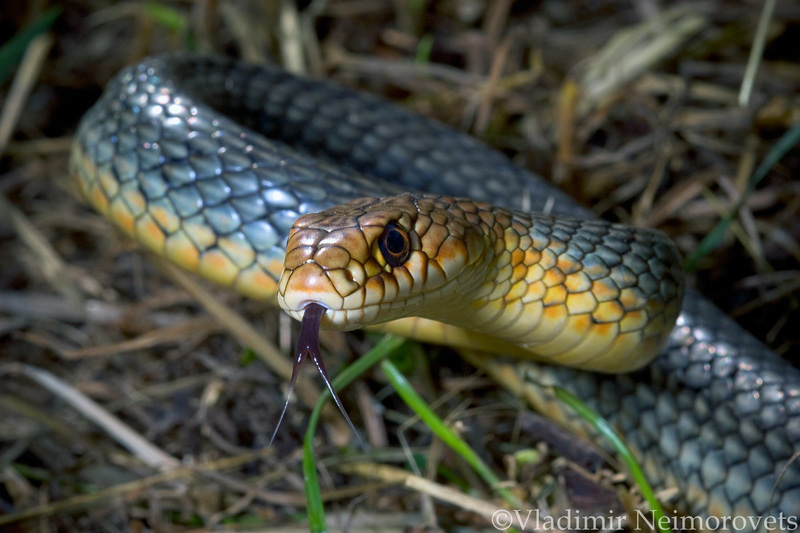 The Caspian whipsnake (Dolichophis caspius) is widespread in South and South-Eastern Europe. This is one of the largest snakes in Europe. In length it can reach 2 m. There are specimens found up to 2.5 m long. The Caspian whipsnake prefers dry habitats: forest edges with thickets of spiny bushes, stony slopes with sparse vegetation, etc. As a shelter it uses cracks in the soil, clefts of rocks, as well as burrows of rodents. Usually it is active during the daytime. Young individuals feed on large insects (beetles, grasshoppers) and small lizards. Adult specimens can hunt for larger prey: rodents, large lizards and even birds, they can also feed on bird eggs. 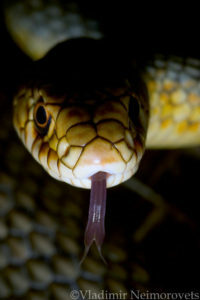 It is considered that the large whipsnake is aggressive snake. Many sources say that it often not only does not give way to man, but on the contrary, actively attacks him. And in some localities you can hear fables from local residents about the unprecedented ferocity of the snake. For example, about how the Caspian whipsnake curls into a ring and rolls in pursuit of the running away man. 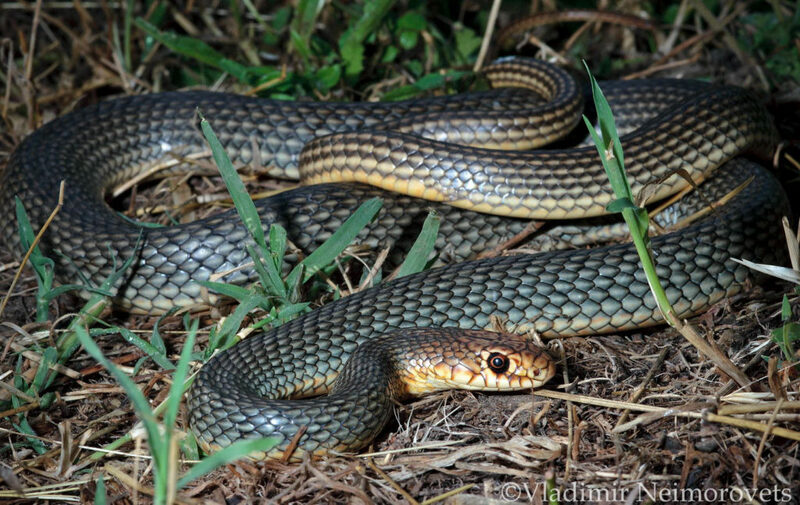 I quite often meet with this whipsnake, including with fairly large specimens. But I was never attacked by it. Rather, I was often chasing after them in the hope of take a picture. But nevertheless this strong snake can painfully bite. It has got a lot of small teeth on its jawls. 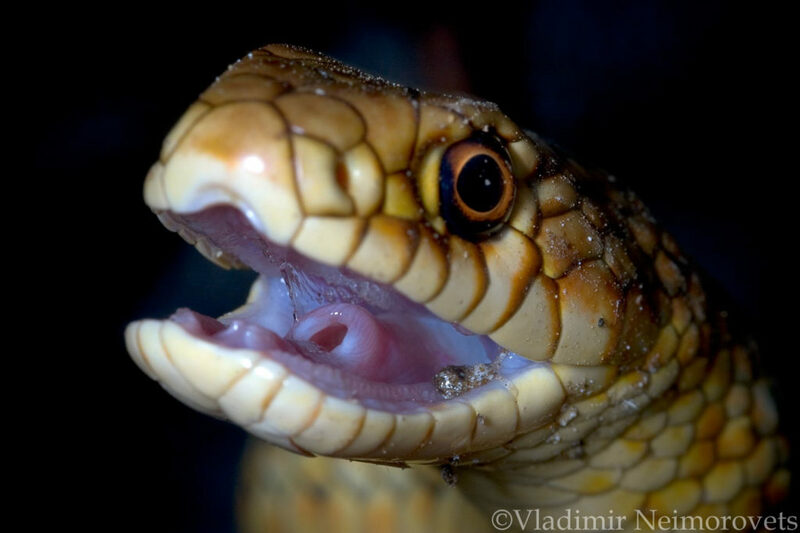 When whipsnake bits in the arm or leg, it begins to turn around on his axis and with his small teeth rips the skin. In any case, when you are meeting with the Caspian whipsnake, you must be careful and don’t touch it with your arm or leg. The population of this species is shrinking everywhere and not only because of the reduction of suitable habitats, but from direct destruction by humans.